Home » How do I use the Modeller? How do I use the Modeller? To use the modeller - click on the 'open the modeller' link at the bottom of the page. To change the pay, inflation and pay increase figures, drag the square slider along the bar. Drag the slider to choose an inflation figure (between 0% and 5%). This is an assumed figure only. The figure that will be used to work out your benefits in the future will depend on the Consumer Prices Index (CPI) measure of inflation each year. 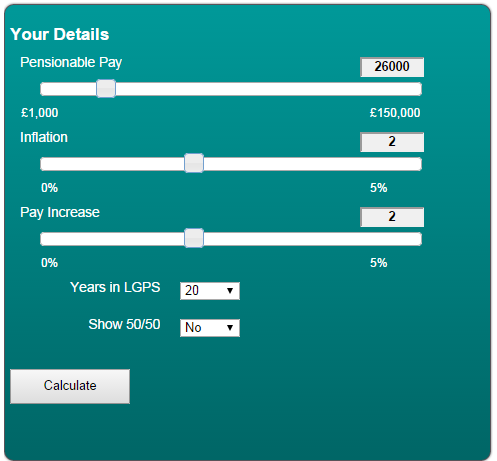 Drag the slider to choose an assumed pay increase in the future (between 0% and 5%). This illustrates how possible pay increases might impact your pension in the LGPS. Select the number of years you expect to be in the new LGPS from April 2015. The minimum is 2 years because that is the minimum period of time you need to build up a pension in the LGPS. The maximum you can input is 50 years although there is no limit to the number of years you could have in the Scheme. Select ‘Yes’ if you wish to see the impact of being in the 50/50 section for the number of years you selected. The 50/50 section is designed to be a short-term option for when times are tough financially and your employer is required to re-enrol you back into the main section of the Scheme every three years. Then click 'Calculate' to see your results.